Samsung Electronics released its keynote speaker and program schedule for Samsung Developer Conference (SDC), the arena that brings together some of the world’s most prominent innovators, entrepreneurs, artists and storytellers that are shaping the future of connected thinking and technology. SDC 2017 will feature a special keynote from DJ Koh, President of Mobile Communications Business at Samsung Electronics, who will unveil Samsung’s vision to connect all devices and services in an intuitive way and discuss a new initiative to create a seamless cloud experience for users. Additional notable keynote speakers include Samsung Electronics Executive Vice Presidents Injong Rhee, Head of R&D, Software & Services of Mobile Communications Business and Eui Suk Chung, Head of Service Intelligence of Mobile Communications Business. Special guest participants will include Stan Lee, world renowned former editor-in-chief of Marvel Comics. Rain Paris, musician and YouTube star, will join Lee to lead a discussion of how connected thinking motivates creativity and disruption in a session called “Marvel, Movies and Music.” Arianna Huffington, Thrive Global founder and CEO, will join Marc Mathieu, CMO of Samsung Electronics America, in a keynote conversation on Samsung and Thrive’s shared philosophy on the use of technology to create social good. 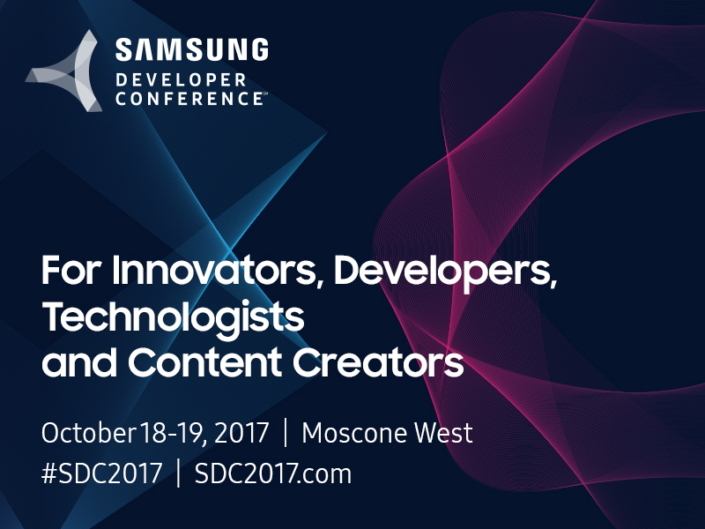 Additionally, SDC 2017 will feature a Creators Track, with talks from some of the most innovative and creative minds at the intersection of intelligent technology and design. At SDC 2017, attendees can expect to learn about Samsung’s new initiative in creating a seamless cloud experience, which is part of its broader efforts to provide an easy and consistent user experience across devices. Samsung will also showcase its commitment to an open ecosystem of partners in areas including IoT and Artificial Intelligence (AI). Attendees will also have the opportunity to help build the next generation of services by learning about myriad topics including enterprise, games & entertainment, health, intelligence, IoT, mobile, payment, security, smart TV, virtual reality and wearables through technical talks, hands-on experiences and thought leader panels. This year’s event will also feature activities such as stream.Code101, an in-depth and hands-on instruction for developers around emerging services such as VR, Samsung DeX and SmartThings, as well as Open Theater, an open stage for events and presentations such as startup pitch idea presentations, an Ask-Me-Anything session with Stan Lee and more. SDC 2017 is a two-day event for leaders to network and learn about the next wave of intelligent technology. You can learn more about the SDC 2017 speakers here, and the full agenda here. To sign-up for this year’s conference, visit https://www.sdc2017.com and register for your place today. Additional information can be found on Twitter (@samsung_dev) and at the hashtag, #SDC2017.